Available to fit Full, 1/2, 1/3, 1/4, and 1/6 size pans. Supports products and promotes drainage. Supports products and promotes drainage. They fit right inside your food pan allowing juices and moisture to drain quickly. 20.88" X 12.75" X 2.5"
This 20 7/8 inches by 12 3/4 inches polycarbonate Drain Shelf supports food products and promotes drainage. They fit right inside your food pan allowing juices and moisture to drain quickly. Standard size which fits most correspondent GN hotel pans. All inserts are stackable and have rounded reinforced edges. The World-Cuisine Paderno series is a part of a lineage of cookware more than 80 years old. It is NSF approved.Material: Polycarbonate. 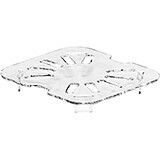 12.5" X 10.5" X 2.5"
This 12 1/2 inches by 10 1/2 inches polycarbonate hotel food pan lid is a standard size which fits into universal racks, heating elements and walk-in coolers. This standard was intended to rationalize the working processes in food industry operations by creating a high level of compatibility of kitchen equipment. The World-Cuisine Paderno series is a part of a lineage of cookware more than 80 years old. It is NSF approved.Material: Polycarbonate. 12.75" X 7.12" X 2.5"
This 12 3/4 inches by 7 1/8 inches polycarbonate Drain Shelf supports food products and promotes drainage. They fit right inside your food pan allowing juices and moisture to drain quickly. Standard size which fits most correspondent GN hotel pans. 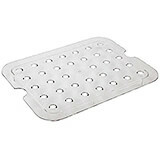 All inserts are stackable and have rounded reinforced edges. The World-Cuisine Paderno series is a part of a lineage of cookware more than 80 years old. It is NSF approved.Material: Polycarbonate. 7" X 6.25" X 2.5"
This 7 inches by 6 1/4 inches polycarbonate Drain Shelf supports food products and promotes drainage. They fit right inside your food pan allowing juices and moisture to drain quickly. Standard size which fits most correspondent GN hotel pans. All inserts are stackable and have rounded reinforced edges. The World-Cuisine Paderno series is a part of a lineage of cookware more than 80 years old. It is NSF approved.Material: Polycarbonate. 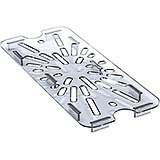 25.5" X 20.88" X 6"
This 25 1/2 inches by 20 7/8 inches polycarbonate Drain Shelf supports food products and promotes drainage. They fit right inside your food pan allowing juices and moisture to drain quickly. Standard size which fits most correspondent GN hotel pans. 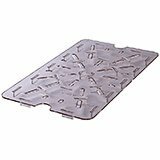 All inserts are stackable and have rounded reinforced edges. The World-Cuisine Paderno series is a part of a lineage of cookware more than 80 years old. It is NSF approved.Material: Polycarbonate.